Some say environmentalist Linda Sheehan went through a midlife crisis. But she calls it an "awakening." Sheehan -- by all accounts one of California's most effective environmental lobbyists -- had grown frustrated in 2010 after about 20 years of advocacy. The California Coastkeeper Alliance, where she was executive director, was meeting its goals, but waterways were still polluted. "I felt that we were doing everything we needed to do and still seemed to be short of what we needed to achieve," Sheehan said in a recent interview. "We were getting advances, but we weren't winning the war." So Sheehan turned her attention to reforming environmental laws. 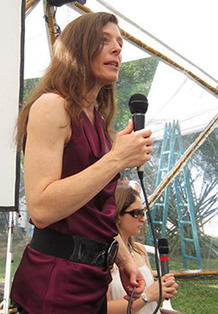 Now executive director of the Earth Law Center, a plucky Bay Area nonprofit with just three employees, including Sheehan's college-age daughter, Sheehan is calling for a paradigm shift in how laws -- and, thus, the courts -- view nature. The nation's most important environmental laws, she argues, condone the degradation of natural resources and threats to public health by allowing polluters to continue discharging contaminants, albeit within permit limits. The laws view the environment as property, she contends, instead of taking a more holistic view. Nature, she argues, has inherent legal rights. Welcome to the "rights of nature" movement, which Sheehan compares to earlier crusades to secure full rights of citizenship for African-Americans and women. Both groups, she notes, were once considered property. Linda Sheehan delivers remarks in June 2012 at the People's Summit of the United Nations Conference on Sustainable Development in Rio de Janeiro. Photos courtesy of Sheehan. At its most basic level, she said, the goal is to give the environment a chance to stick up for itself against polluters in court. Complications abound. How, for example, can the Gulf of Mexico sue BP PLC for the Deepwater Horizon spill? Is the Gulf the plaintiff or are its lawyers? But Sheehan can point to concrete, if incremental, successes. The Santa Monica, Calif., City Council passed an ordinance this year that gives the environment its own bill of rights. Vancouver, British Columbia, is working on a similar plan. Ecuador has passed a constitutional amendment in the same vein. The movement has attracted backers around the world who believe all possible environmental gains under current statutes have already occurred. "As someone who has been in the trenches for a long time, it feels like we are really getting to the end of where we can go with those laws. So, it's frustrating," said Deborah Sivas, a leading environmental litigator now at Stanford Law School. "Linda has taken a different tack," Sivas said. "Let's step back and look at it more from a philosophical level and how we think about a set of ideas that we could translate into changing the law." Sheehan, 49, grew up the oldest of four kids in Norwood, Mass. She spent her youth playing in the woods several miles southwest of Boston and remembers when a local creek became so polluted that people were forced to stop fishing there. The experience sparked her interest in the environment, and she put herself through the Massachusetts Institute of Technology, earning a degree in chemical engineering. From there it was off to the University of California, Berkeley, for a master's degree in public policy and law degree. She then spent 10 years at the Ocean Conservancy before jumping to California Coastkeeper Alliance, where she served as the group's executive director and top lobbyist in Sacramento. Other advocates were unanimous in their praise of Sheehan's work at the conservancy and the alliance. David Pettit, an attorney in the Natural Resources Defense Council's Santa Monica office, said Sheehan was particularly effective in their effort to crack down on once-through cooling about three years ago. Power plant operators on the coast were sucking in ocean water to cool their units, then immediately discharging it without treatment. The process was particularly harmful to marine life, and Sheehan worked for years to persuade the state to impose stricter regulations on the 19 existing coastal power plants, including two nuclear facilities. "She was very good at looking at the big picture and seeing how different tools -- litigation, policy advocacy and others -- all fit together to get to where the environmental side wanted to go," Pettit said. Sheehan also knows how to pick a fight -- and how to handle herself when there's trouble. She has attended a mixed martial arts studio four or five times a week for 10 years. She's partial to sleeveless tops that show off muscular arms -- and often bruises. Her gym, which specializes in Krav Maga -- a martial-arts discipline derived from street fighting and used by the Israel Defense Forces -- has helped her cope with professional frustrations. "As an advocate, we work really hard," she said. "We care a lot and sometimes you care so much you want to get out some of the difficulties of the day in a safe and healthy environment." Before Sheehan arrived, the Earth Law Center largely existed as an academic endeavor. The organization was founded as the Center for Earth Jurisprudence in 2008 to support programs at two Florida law schools, the Barry University School of Law in Orlando and St. Thomas University School of Law in Miami Gardens. Two years later, Patricia Siemen, the program's founder and a Dominican sister, sought to expand its influence. "We saw the need to move the whole rights of nature movement so that it had an organizational structure and so that it would move beyond university and academic settings," Siemen said. She founded the center under the premise of humanity having a "foundational responsibility to respect the inherent rights of all beings and ecosystems to exist, thrive and evolve." Sheehan, who was then grappling with the limits of current environmental statutes, quickly hit it off with Siemen. They shared the mindset that current laws viewed the environment as something apart from humanity. "The dominant perception is that we are not part of nature or that the environment is something outside ourselves," Siemen said. In her view, nature should not be perceived a property or "a resource solely for human use." 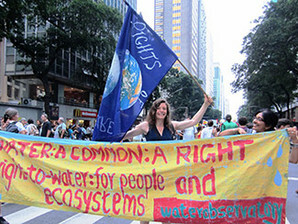 Sheehan marches at the U.N. Conference on Sustainable Development People's Summit in the streets of Rio de Janeiro. There is some historical precedent for this line of thinking. During the height of the environmental movement in 1972, Christopher Stone wrote "Should Trees Have Standing?" arguing for extending legal rights to nature. While acknowledging that granting rights to new entities always sounds "odd or frightening or laughable" at first, major civil rights cases and women's rights cases led to significant changes in how the law views women and African-Americans. To that end, Stone wrote, "I am quite seriously proposing that we give legal rights to forests, oceans, rivers and other so-called 'natural objects' in the environment -- indeed, to the natural environment as a whole." The same year, Supreme Court Justice William Douglas espoused a similar view in Sierra Club v. Morton. The Sierra Club was challenging a Forest Service permit to develop a ski resort near Sequoia National Park in the Sierra Nevada. The high court held that the Sierra Club lacked standing to bring the lawsuit, meaning the group had not proved how it, in its capacity as a corporate nonprofit, was injured by the permit or development. Douglas dissented. He argued that rivers and streams have their own basis for standing when they are exploited, and those who enjoy them should be able to bring lawsuits to protect them. "The river, for example, is the living symbol of all the life it sustains or nourishes -- including man, who are dependent on it or who enjoy it for its sight, its sound, or its life," Douglas wrote. "The river as plaintiff speaks for the ecological unit of life that is part of it. Those people who have a meaningful relation to that body of water -- whether it be a fisherman, a canoeist, a zoologist, or a logger -- must be able to speak for the values which the river represents and which are threatened with destruction." Sheehan has taken on the monumental task of turning that legal philosophy into reality. Since signing on to the center, she has kept a frenetic schedule. She has appeared on United Nations panels, marched in rallies, taught classes at Vermont Law School and other prominent law schools, and written countless papers on how to draft better environmental laws. She also doesn't shy away from criticizing most current environmental advocacy as missing the bigger problems lying within the statutes. Current laws, she said, "harness" and "pen in" advocacy. "What is the problem we are trying to solve?" she asked. "It's not just about how we implement the Clean Water Act. It's how can we ensure waterways are healthy." Her efforts, along with others within the movement, have seen some results. Ecuador, for example, passed a constitutional amendment in 2008 that states that nature "has the right to exist, persist, maintain itself and regenerate." Further, it states, "any person ... may demand the observance of the rights of the natural environment." One lawsuit has been successfully brought using the amendment. In 2011, an Ecuadorian court stopped road construction debris from being dumped in the Vilcabamba River. The lawsuit was brought by landowners in nearby Loja. In the United States, Pittsburgh adopted a local ordinance in 2010 that banned hydraulic fracturing, or fracking, for natural gas within city borders. The ordinance says any resident "shall have legal standing to enforce" the "rights of natural communities" and ecosystems. And Santa Monica's City Council approved its "Sustainability Bill of Rights" in April. The effort was undertaken after the Supreme Court's landmark Citizens United v. Federal Election Commission decision in January 2010. The ruling gave corporations the ability to spend unlimited money on campaign ads to influence elections. The decision raised concerns among Santa Monica environmentalists that courts were giving corporations the ability to trump community interests. Sheehan worked with the City Council to draft a response. It states that residents have a right to clean water and clean air and that corporate entities "do not enjoy special privileges or powers under the law that subordinate the community's rights." The bill also gives any individual the ability to bring a lawsuit against a corporation or company for polluting. "It's affirming our environmental rights in a legal way that no one has ever done before," said Mark Gold, chairman of the city's task force on the environment. "It's giving both the city and the public the ability to go after individual polluters from the standpoint of cleaning up the environment." Gold, who's also the associate director of the University of California, Los Angeles' Institute of the Environment and Sustainability, said Sheehan's work on the ordinance was "almost supernatural." "Linda," Gold said, "is one of the smartest and most efficient people I have ever met." Sheehan still has a very long way to go, though. There's been little push-back on Sheehan's efforts from industry, largely because her movement hasn't reached a point where it has curtailed industry activities or led to lawsuits. Moreover, many legal experts wonder whether the Santa Monica effort and others will hold up in court. "They haven't manifested in any legal doctrine," said Patrick Parenteau a Vermont Law School professor. "They haven't gained any traction in the courts. But proponents like Linda, they are looking long term." Pettit, the Santa Monica-based NRDC lawyer, said environmentalists will continue to face standing challenges under the new laws, especially because many influential courts are trending toward a more narrow view of who has standing in environmental cases. "You can't just go into court and say, 'I'm suing on behalf of these trees,'" Pettit said. "That's not going to last two minutes." Parenteau and Sheehan both noted that there will likely be progress on standing in other countries first. "Standing as it is right now can evolve," Sheehan said. "And in many other countries standing is much more liberal than it is here." Aside from how it's viewed in the courts, the grass-roots aspect of Sheehan's work has many harking back to the environmental movement of the late 1960s and 1970s. And that, Stanford professor Sivas said, may be what's needed to change environmental laws. "I'm not sure how it will play out in the courts," Sivas said. "But getting communities and local decisionmakers to think about these issues more deeply could, in the long term, be the way to go."